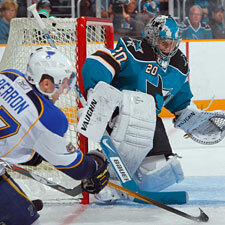 SAN JOSE, Calif. (AP) -The San Jose Sharks have been playing their best hockey of the season over the last few weeks. What they did in the first period against St. Louis took it to another level. 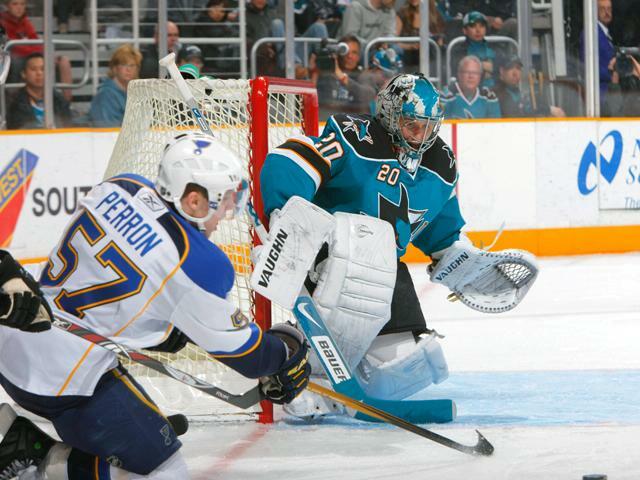 Milan Michalek scored on the opening shift, San Jose added three more goals in its highest-scoring period of the season and the Sharks coasted to their franchise-record 11th straight victory, 4-1 over the Blues on Friday night. "We came out flying," forward Jeremy Roenick said. "The first shift set the tone for the whole game. That's what we have to continue on here, our strong starts. We're tough to beat when we get a lead." Roenick, Brian Campbell and Patrick Marleau also scored in a dominant four-goal opening period that helped San Jose increase its lead in the Pacific Division over idle Dallas and Anaheim. The Sharks are three points ahead of the Stars and four in front of the Ducks, with two games in hand over both teams. That's quite a turnaround from the end of last month when San Jose was 11 points behind Dallas. All it took to erase that was the longest winning streak in the NHL since New Jersey won its final 11 games of the 2005-06 season. "It's a good win for us," Campbell said. "It's what we need right now when we have games in hand. We have to take advantage of those." While many of those games were close - all decided by two goals or fewer with two going to shootouts and a third decided in overtime - this one was over almost from the start against a Blues team that has lost 11 of 12. San Jose's top line led by Joe Thornton applied heavy pressure on the opening shift and it paid off when Campbell fed Michalek, who beat Hannu Toivonen into the top of the net just 1:10 into the game. The Sharks didn't let up and the onslaught was on from there. "When you have the lead, you can afford to make a mistake here or there and you're not going to be behind," coach Ron Wilson said. "It keeps the other team on their heels and gets your crowd into it. When you have a first shift the way we did with three or four quality scoring chances before we scored you create in them, 'Oh no, here we go again.' You just have something to build on." Roenick tipped in a shot from the point by Craig Rivet just 1 second after Andy McDonald's high-sticking penalty ended to make it 2-0 midway through the period. Less than 2 minutes later, Thornton fed a trailing Campbell for a one-timed shot that beat Toivonen for his seventh goal of the season. "It's almost a nightmare at times when you step on the ice and you have a line of Marleau, Jonathan Cheechoo and Thornton coming at you full speed," Blues forward David Backes said. "When you dig yourself a hole like that in the first 10 minutes of the game, to expect to climb out is unrealistic." The scoring barrage was capped when Erik Johnson pulled Marleau down from behind for a penalty shot. Marleau converted from there to make it 4-0 at 13:25. Evgeni Nabokov made 19 saves for his league-leading 41st win for the Sharks, allowing only a power-play goal by Backes 54 seconds into the second period. San Jose swept the four-game season series from the Blues, outscoring them 11-2. "That's one of the best teams in the NHL," Toivonen said. "We have to find a way to play like that and then maybe we'll win games." Notes: The last team to win more than 11 straight in one season was also the Devils, who won 13 regular-season games in a row from Feb. 26 to March 23 in 2001. ... The Sharks are 2-for-5 this season on penalty shots. ... Thornton had two assists to give him 64 on the season, moving past Boston's Marc Savard (63) for the NHL lead. ... The Blues have lost the first five games on a franchise-long, nine-game road trip.